Events » Development of Education in Human Rights » Education in the Sphere of Human Rights: where do we go? Education in the Sphere of Human Rights: where do we go? Ukraine has not yet developed the national plan for human rights education for the system of secondary-level education. Such plan should have been developed and executed according to the obligations of Ukraine within the World Program for Human Rights Education. The Program was initiated by the United Nations, while the deadline for the submission of national plans is officially over. 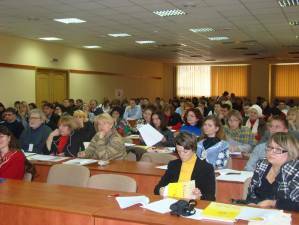 At present the national plan is being developed for the system of higher education of Ukraine. In order to appraise a current situation concerning human rights education in Ukraine and to work out recommendations as to the strategy of its development on 15-16 October 2010 in Kyiv there was held a Conference on the development of human rights education in Ukraine. The Conference was devoted to the development of formal and informal education in the sphere of human rights and was one of the activities of the Understanding Human Rights All-Ukrainian Educational Program. 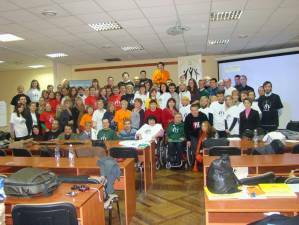 •	What is the level of human rights education development in Ukraine? •	What could each of us do to promote the effectiveness of the educational plan development? •	What should the government do? The welcoming speeches at the opening of the conference were given by the representatives of several organizations and funds directly contributing to the implementation of the Understanding Human Rights All-Ukrainian Educational Program. These were Enver Djuliman, the Head of the Education Department of the Norwegian Helsinki Committee, Liana Moroz, the Manager of the Rule of Law Program of the International Renaissance Foundation, Volodymyr Yavors’kyi, the Executive Director of the Ukrainian Helsinki Human Rights Union, and Serhii Burov, the Coordinator of the Understanding Human Rights Program, as well as the Head of the non-governmental organization M’ART, and others. Among the special guests of the conference there were representatives of embassies of foreign countries, partners from Belarus, Russia, Poland, Norway and Moldova. A contribution to the work of the conference was made by the representatives of the Embassy of the Federative Republic of Germany and of the United States in Ukraine. Governmental institutions were represented by Yurii Zaitsev, the Governmental Commissioner on the European Court of Human Rights, and Stepan Tymochko from the Ministry on Family, Youth and Sport Affairs of Ukraine. The latter officials were actively involved in the work of the conference. -	A low level of awareness of human rights, fundamental freedoms and democratic values among the society detracting activities of citizens aimed at the presentation and protection of public interests. -	The substitution of the content of human rights. Such practice, unfortunately, allows using human rights as a political instrument applied in political debates to manipulate public opinion. -	The absence of an official model of continuous education in the sphere of human rights. -	The lack of specialists able to use educational activities effectively with an aim to protect and support human rights. -	A need for practical specialized educational human rights programs for the activists of non-governmental organizations. 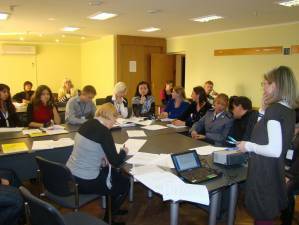 The conference was held in the form of plenary meetings and thematic group work. During the plenary meetings participants gave reports on their experience and invited colleagues for cooperation. 	It was important that the character of the conference was rather practical than formal, – Oleksander Voitenko, one of the Coordinators of the Understanding Human Rights Program, mentioned. – The reports contributed to the establishment of cooperation and new contacts. It should be mentioned that the planned network of human rights activists is already at the stage of formation. The thematic group work was one more essential component of the conference. The considered issues were the following: teaching human rights to civil activists and journalists, in higher educational establishments and in the interests of people with disabilities; and the role of human rights education in the work with children of risk groups, etc. 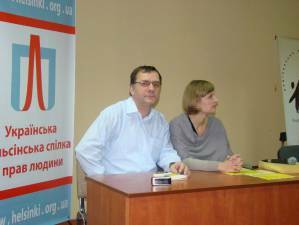 I mostly remembered recommendations as to the work with children of risk groups, – Yaroslav Minkin, one of the graduates of the Program, said. – The recommendations related to the special training of officers of the Ministry of Interior of Ukraine on how to work with children of risk groups. I also consider an idea to teach human rights in higher educational establishments not only in the formal but also in the informal way to be rather important. All the recommendations will be collected in the nearest time and offered for discussion to all those who are interested on one of the websites of the Understanding Human Rights Program. After being discussed and handled the recommendations will be referred to the intended governmental institutions in the form of a resolution. Submitted by NohaKhan on Sun, 2017-08-13 00:03. Submitted by xukaimin on Fri, 2017-06-02 07:21. Submitted by xukaimin on Thu, 2017-05-18 10:32. Submitted by chenjinyan on Sat, 2017-04-22 04:02. Submitted by zhengjx on Fri, 2017-04-07 05:09. Submitted by xukaimin on Fri, 2017-03-24 07:44. Submitted by leilei3915 on Thu, 2017-03-23 09:51. Submitted by chenlixiang on Wed, 2017-02-08 03:06. Submitted by dongdong8 on Tue, 2017-01-10 10:40. Submitted by 20161006caihuali on Fri, 2016-11-18 10:33. Submitted by qqqqqing on Wed, 2016-10-19 10:53. Submitted by truballer2 on Thu, 2016-07-21 03:52. Submitted by outlet on Mon, 2016-02-29 12:35. Merry Christmas indeed! The NBA’s annual Christmas Day showcase always brings some incredible on-feet wears for the very special occasion, and this year’s slate featured five rather close games in jordan 11 an awesome bonus to the holiday festivities. Jordan Clarkson might’ve stolen Kobe’s thunder by bringing back the Nike Kobe 6 “Grinch” in an unexpected Jordan 11 Concord twist. Steph Curry and LeBron battled in Golden State, each sporting two very different colorways representing what a holiday-themed sneaker should look like. Steph new jordan shoes laced up the vibrant UA Curry 2 “Northern Lights” while LeBron donned his subtly tonal “Christmas” LeBron 13s. But perhaps the star of Christmas new jordans Day was Draymond Green, who was seemingly the only player not having an off game during the Warriors-Cavs matchup. Dray didn’t want to face Air Jordan 4 Alternate 89 LeBron in well, LeBrons, so he started the game off in the Nike Zoom Flight Hawk from the recent “Make Up Class of 97” jordan shoes Pack. Green would return to the Nike LeBron Soldier 9 by the second half. Check out a full recap below and stay tuned for jordan releases more NBA Feet updates right here on Sneaker News. Air Jordan PEs for the Oregon Ducks were put to a short halt, but today jordans 2016 we’re getting a first look at the next athletes-only issue in the form of the Air Jordan XIV. The upper is a seamless grey jordans 2015 suede upper with debossed Ducks logos all over the material, while the signature “O” is embroidered on the re-designed heel. Don’t bet on a Jordan Retro 8 Concord release, but we wouldn’t be surprised cheap jordans if these showed up on eBay at high prices. Get a look below and let us know where these rank among all the Oregon Jordan Retro PEs in history. Submitted by cai20151207 on Mon, 2015-12-07 09:50.